When springtime comes, in his warm winter den a bear wakes up very hungry and thin!..." Bear finds some roots to eat, but that's not enough. He wants more! With his friends' help, he finds some berries, clover, and fish to eat, but that's not enough. Bear wants more! How Bear's friends help him to finally satisfy his HUGE hunger in a most surprising way will enchant y When springtime comes, in his warm winter den a bear wakes up very hungry and thin!..." Bear finds some roots to eat, but that's not enough. He wants more! With his friends' help, he finds some berries, clover, and fish to eat, but that's not enough. Bear wants more! How Bear's friends help him to finally satisfy his HUGE hunger in a most surprising way will enchant young readers. 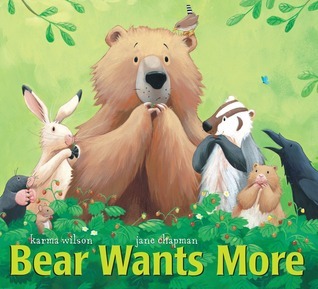 Karma Wilson's rhythmic text and Jane Chapman's vibrant illustrations make Bear Wants More a perfect springtime read-aloud.